A man can have anything, if he is willing to sacrifice. So begins the beautifully conceived and highly acclaimed Blur Studios trailer for the upcoming expansion to Star Wars: The Old Republic. Interesting word, sacrifice. It’s meaningful to BioWare too, apparently. In fact they chose it as the title for the four and a half minute film. It might interest the reader to know that the original thematic framework for the Knights of the Fallen Empire cinematic featurette was not Sacrifice. but rather Destiny. I love SWTOR; I am quite open about it. But as I have previously discussed, there have been ripples upon the placid surface of our relationship over the past several months. I didn’t exactly want to break up with the game but I was seriously considering suggesting that we see other people. Based on what I was seeing in the media, I was pretty sure that EA was a lot more interested in Star Wars Battlefront than in The Old Republic. And from what I was reading on social media, SWTOR players were leaving the game in droves over things like mismanaged exploits, broken Operations bosses, lack of new PvP maps and no new raids on the horizon. Still, as disillusioned as I was becoming, the Knights of the Fallen Empire trailer was my romantic movie moment and I experienced a thrill of hope seeing those powerful images and relationships unfold on the screen. But what happens after the credits roll and the lights come up? Bioware dropped a big bomb on the community last week with a developer post that came out and told us that we were not getting any new flashpoints or operations with the Fallen Empire so please stop asking. While I am very grateful for the transparency (by game developer standards) I was disappointed by the news. Chiefly what concerns me is what I consider the worrying trend of dumbing down the mechanics of gameplay in the form of tactical flashpoints. An MMO should, in my opinion, require a three-role system, i.e. tank, damage and healer. Trinity mechanics are what separates the MMO from the single player game or, you know, Pacman. If a game allows players to do all their group play in role-neutral combat, how will those players effectively participate in operations? Not all the news was bleak. The post discussed the fact that the current operations will be reworked for the new level cap and all raid encounters will now drop gear that is appropriate for level 65, so it will make doing some of the older Ops relevant again. Then as I was still processing this latest information, something else happened. 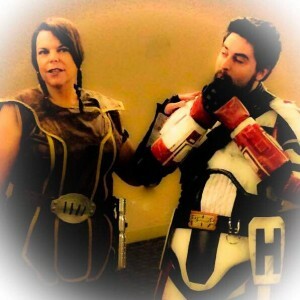 I went to the SWTOR story panels and Community Cantina event at San Diego Comic Con. And pitter-patter went my heart once again. Why? Relationships. SWTOR sat me down and we had a heart-to-heart. They told me what was on their mind and asked me to tell them what was on mine. They said they have story, mad story, if I will just be patient and trust them. They want to give me everything, they really do, but no game is perfect and no game can be all things to all people all of the time. They want me to know that they do love the players and want to provide me with everything I am asking for but they also have to be true to who they are. So I needed to ask myself the real question. What keeps me in SWTOR and not playing one of the other fine MMOs out there? Progression raiding? PvP? Flashpoints? The answer for me personally is none of the above. I love those components, to be sure, but all of those things exist in other games and in some cases the other games do them better. The Old Republic, like all things Star Wars, is about stories, characters, and relationships. I have never seen anything that can compete with the cinematic cutscenes of SWTOR. The voice acting and the gorgeously detailed graphics set the bar impossibly high. The snappy dialogue, plot twists and betrayals, the personal journeys and the overarching sense of being a part of the story in a real way makes the Old Republic a truly great piece of art. That’s why I fell in love in the first place. The developers have told us again and again in the month since the Fallen Empire trailer release that they are returning to what they do best and what makes them special. They are going to elevate what is already remarkable interactive storytelling to a whole new level of player-driven plots and nonlinear gameplay. They are going to consistently put in the hard work and time a relationship needs with new episodes coming out regularly to keep players engaged and, hopefully, in love. 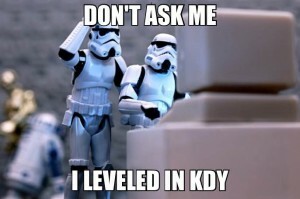 Will KotFE have you falling in love with SWTOR, again? So what about sacrifice? What is SWTOR asking me to give up in order to have this beautiful new story created for me? For now, they are asking me to temporarily put aside my desire for new PvP maps and new group content to pursue this personal journey with them. Like Emperor Valkorion at the end of the Fallen Empire trailer, SWTOR has stretched a hand out saying “come with me.” And I will, for perhaps, after all, it is my destiny.